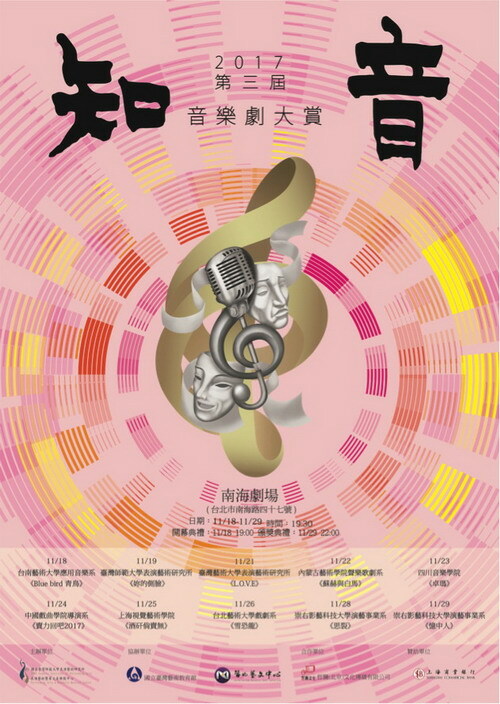 The 2017 3rd Music Award for Bosom Friends hosted by the Graduate Institute of Performing Arts, National Taiwan University is scheduled to hold a musical competition for 10 consecutive evenings beginning November 19th, 2017. Involving students from nine universities (Department of Applied Music, Tainan National University of the Arts; Graduate Institute of Performing Arts, National Taiwan University; Graduate Institute of Performing Arts, National Taiwan University of Arts; Department of Vocal and Opera, Art College of Inner Mongolia University; Sichuan Conservatory Of Music; Shanghai Institute of Visual Arts; School of Theatre Arts, Taipei National University of the Arts; Department of Popular Performing Art, Chungyu University of Film and Arts) and all works submitted are original scripts and music. Focus：This activity offers actors/actresses a platform, resources and an opportunity to promote quality performances to media and serves as a platform that allows performing arts majors, young directors and playwrights and other relevant talent to learn from each other and enter the market.